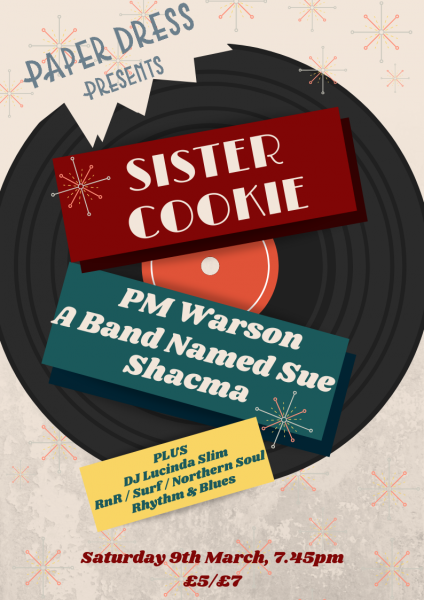 Sister Cookie w/ PM Warson, Band Named Sue, Shacma + DJ Lucinda Slim! Get ready to shake your chassis – we’ve got a very special night of live funk, bluesy soul, and good ol’ fashioned rock and roll plus DJ Lucinda Slim keeping you dancing till 3am! Lagos-born Londoner and avid vinyl collector SISTER COOKIE has wowed audiences with her unique sound and charisma at a plethora of venues and festivals across Europe, and appeared on well-received records by acts such as The Soulful Orchestra, MFC Chicken and The Future Shape of Sound. She now performs with her own band – a London-based quartet that consists of some of the finest musicians in the capital. And we have some incredible artists supporting.. Boogie woogie to A Band Named Sue, who are here to relive the golden years of Johnny Cash, Fats Domino, Big Joe Turner, Clarence Frogman Henry and Nancy Sinatra. And DJ Lucinda Slim will be busting out all the good stuff till the early hours with a vinyl only set of Northern Soul, Surf, Rhythm & Blues & RnR!